Justin and I have a travel bucket list of classic places like Torres del Paine in Patagonia, the Blue Lagoon in Iceland, and Machu Picchu. However, there are SO many amazing places out there that frequently don't show up on travel bucket lists. As such, I decided to compile a list of some of the lesser known places I really want to visit. Now when I say lesser known, I'm not saying these places are practically unknown. For example, I'm aware that many people have heard of and visited the Whitsunday Islands, but compared to, say, the Taj Mahal, it's a lesser known place when it comes to bucket list travel locales. What are some of your lesser known bucket list destinations? This amazing national park in northern Brazil appears to be a desert at first glance, with mile upon mile of soaring sand dunes. However, the 47 inches of rain the area receive each year creates an amazing phenomenon - thousands crystal clear lagoons in the valleys between the dunes. There's nothing quite like it anywhere else in the world. At the peak of the rainy season some of the lagoons can reach 300 feet in length and 10 feet in depth! The best time to visit is between July and September when the lagoons are at their fullest. This amazing area of Tasmania stretches from Binalong Bay to Eddystone Point and is known for its flaming orange lichen covered rocks. Although the lichen isn't the reason the area originally got its name, it makes the name feel very apropos. It's a photographer's paradise and I'd love to explore all the little coves and inlets. This incredible cave in Vietnam is the largest known cave in the world, yet remained hidden deep in the jungle until 1990, when a local farmer stumbled upon it while seeking shelter from a rainstorm. Although he reported his finding, he was unfortunately unable to retrace his steps and the cave remained hidden for another 18 years until, miraculously, he discovered the entrance once again while out hunting for food. This time, he was able to successfully lead a team from the British Caving Research Association to the cave. The main chamber of the cave is a staggering three miles (5 kilometers) long and reaches heights of 650 feet (200 meters). The size of the cave has led to its own eco system, including its own localized weather system! I first became aware of this cave in an amazing National Geographic article and have wanted to visit ever since. Visiting is tricky though as the cave is only open to 10 visitors at a time, once a week, February through August. Often referred to as a fairyland on earth, Jiuzhaigou Valley was rightly named a UNESCO World Heritage Site in 1992 and was also declared a national park. Situated high in the Min Shan mountain range, the valley (actually three valleys in a Y shape) is known for its 114 astonishingly colorful lakes and amazing multi-level waterfalls. Fable has it that the lakes were formed when a goddess was presented with a mirror made from the wind. The goddess broke the mirror and 114 pieces fell to the earth, creating the glittering lakes of the Jiuzhaigou Valley. The lakes were originally created through glacial activity and the colors depend on depth, sediment, and surroundings. The area also is home to a number of endangered species, including the giant panda and golden snub-nosed monkey. I've long wanted to visit the Isle of Skye, a mountainous mist shrouded island in the Inner Hebrides. Although the weather there is often rainy and windy, I'd love to backpack the Isle of Skye Trail and pay a visit to the Fairy Pools, pictured above. Apparently you can swim there, but a wetsuit is advised as the "mountain springs can be bracing." When we traveled to India a few years ago, I desperately wanted to visit Jodhpur, commonly called the Blue City for obvious reasons. This ancient city in Rajasthan, located on the edge of the Thar Desert, originally used the blue pigment coating only on specific houses to let others know that it was occupied by a Brahmin. Over time though, the color became a kind of identify for non-Brahmins too, leading to the majority of houses in the old city being painted blue. Aside from the color, Jodhpur boasts numerous historical sites and a prominent connection to an extremely rare breed of horse known as a Marwari. The Soça River has to be one of the most beautiful in the world. The river starts in Triglav National Park in Slovenia and flows all the way to the Adriatic Sea, maintaining its incredible emerald color the entire way. It's so magical, part of Prince Caspian was filmed on its banks. With freezing cold temps year round, it is unfortunately not very good for swimming, but white water rafting, kayaking, and stand up paddle boarding are popular. Apparently, there are also numerous hiking trails along the river that cross back and forth via suspension bridges. Sossusvlei is a salt and clay pan in the Namib Desert, surrounded by towering red sand dunes. The iconic color of the dunes is due to the high concentration of iron in the sand and the consequent oxidation processes. The older the dune the more intense the color. These dunes are some of the highest in the world with many reaching over over 650 feet (200 meters). The tallest dune in the Sossusvlei area has been nicknamed Big Daddy and reaches a staggering 1,060 feet (325 meters). Jökulsárlón is a glacial lake on the edge of Vatnajökull National Park, best known for the huge chunks of ice that wash up on its black sand beach from the calving glacier. The ice is one of two colors: milky white/clear or bright blue, based on how much air is trapped in the ice. It is considered one of the natural wonders of Iceland and was even featured on one of their stamps. The area is particularly wonderful at sunrise with the light shining through the ice. Located in the heart of the Great Barrier Reef, the Whitsunday archipelago is comprised of 74 insanely beautiful islands, most uninhabited. Whitehaven Beach on Whitsunday Island is arguably the most famous location in the Whitsundays. Stretching a little over 4 miles (7 kilometers), it is comprised of some of the purest silica sand in the world with an inlet at one end that creates an amazing fusion of colors. When a beach still has five stars after over 1,600 reviews on Trip Advisor, you know it's good! My ultimate Whitsunday dream is to embark on a multi day kayaking trip between the islands. 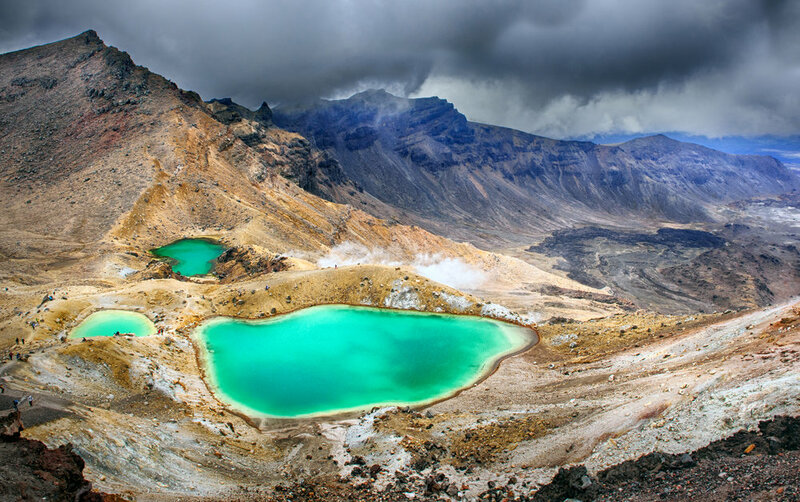 Tongariro National Park is a UNESCO World Heritage Site in Zealand's North Island, dominated by three active volcanos. I would love to backpack the Northern Circuit, a 26 mile (43 kilometer) trail that meanders arounds glacial valleys, craters, and colorful mineral laden lakes. The Tongariro Crossing, pictured above, is the most popular part of the trail and is traversed by around 70,000 people each year. Some friends did it recently and said it was unreal. Talk about a surreal swimming hole. Located on Somoa's main island, Upolo, this 100 foot (30 meter) deep hole was formed during a volcanic eruption and is now filled with salt water due to an underground tunnel that connects it to the ocean. Apparently that tunnel and connection to the ocean causes tidal surges in the swimming hole, so a rope has been suspended mid way across to prevent people from being pulled through the tunnel out to sea! Sounds scary, but I still want to visit. This one is pretty generalized. Altiplano simply means 'high plain' and covers an extensive area of Bolivia (also extends into Peru, Chile, and Argentina), including La Paz and Lake Titicaca. In fact, it's the largest high plain outside of Tibet. My mother lived in La Paz as a child and her experiences in the Altiplano left a lasting impression. One of the major economic activities in the area is llama and vicuña herding, which I would be very interested to see. Thailand has a lot of famous islands, but you don't really hear about the Similans unless you dive. The Similans are comprised of eleven stunning islands in the Andaman Sea off the west coast of Southern Thailand, that bring to mind the Seychelles in my opinion. The islands have been turned into a national park (Mu Koh Similan National Park) and boast world class diving with incredible marine life like manta rays and whale sharks. In fact, the National Geographic Society ranked the Similan Islands as “One of the top 10 dive destinations to visit in the world”. 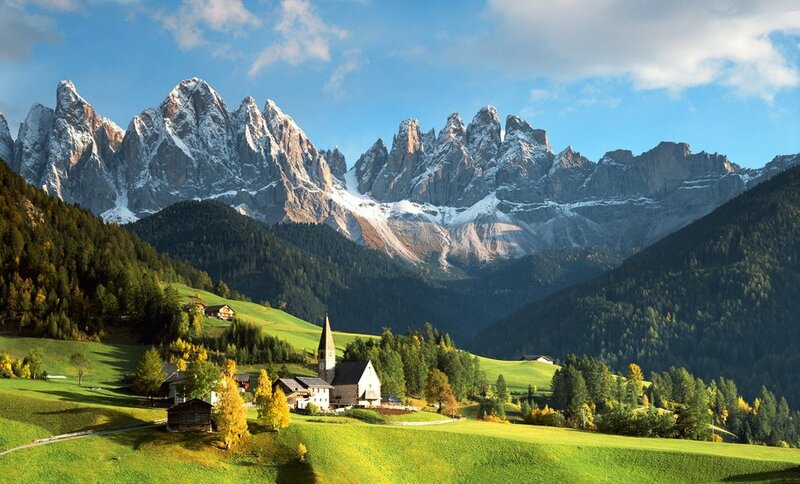 The Dolomites are a UNESCO World Heritage Site mountain range in northeastern Italy. Eight long distance trails called alte vie (high paths) traverse the Dolomites, each taking about a week to hike. Can you imagine backpacking with that kind of view? Add in pristine alpine lakes, rivers, and waterfalls and it's something straight out of a fairytale. Bagan is an ancient city in central Myanmar that served as the capital of the Pagan Kingdom from the 9th to 13th centuries. 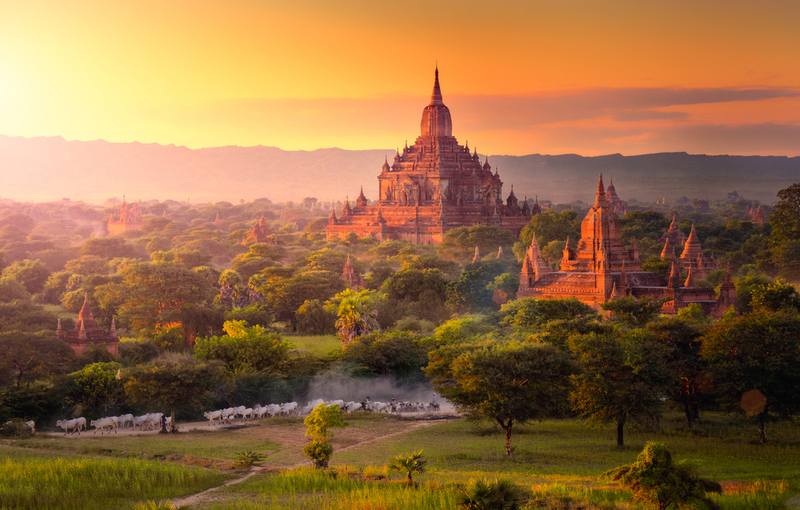 Prolific construction of Buddhist temples, pagodas, and monasteries occurred in the Bagan plains - over 10,000 structures during the 11th - 13th centuries alone! The remains of 2,200 of these temples and pagodas have survived to the present day and are spread across 40 square miles. Talk about a massive archeological site. Photographing the beautiful buildings at sunrise seems to be one of best ways to take it all in. Apparently, hot air balloon sunrise tours over Bagan are also popular.